Baby Charlie born Feb 27, 2018 at 5:29 p.m. 8 lbs 10 oz and 21″ long! Baby Charlie was born at home on Tuesday, February 27th at 5:29 p.m. 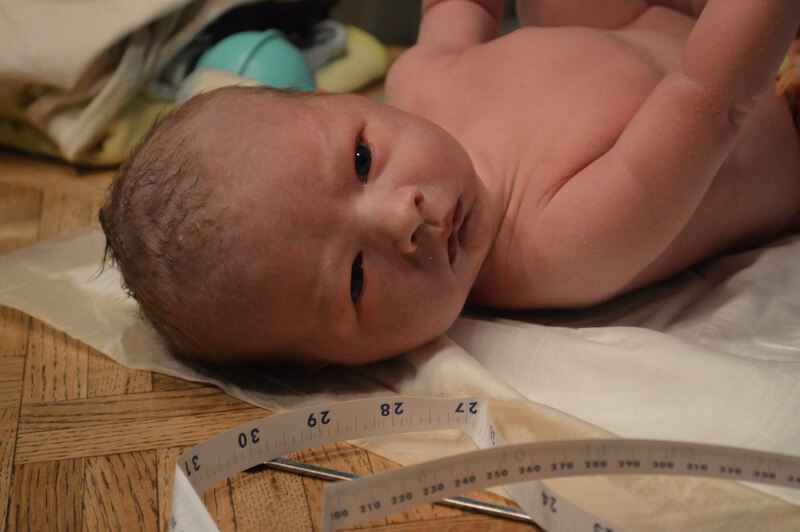 He weighed 8 lbs 10 oz and was 21″ long. The birth seemed to go well for Lacie — although it seemed to go a lot faster than her other three. One thing that stood out to me was that he didn’t cry much right after he was born. Lacie also noticed that he wasn’t sucking at all – even after a few hours. Other then that he seemed ok. His eyes were open, he was alert and his skin color was good. But then we noticed he sounded really congested, like he was trying to cough a bunch of stuff up but couldn’t. Our midwives, Mary and Pita (Lacie’s grandma and aunt), suctioned a lot of fluid out of his mouth and nose several times, which would help but then he’d start to struggle again after it built up. After a few hours we decided to call 911 so the paramedics could assess him. I called around 10:00 p.m. and in less than 10 minutes the firemen showed up first, followed by the ambulance (paramedic and EMT). They hooked him up and his heart rate and oxygen levels were ok but when you looked at his chest you could tell he was working really hard to breathe. His chest would sink in a lot around his little lungs and he was breathing hard. They asked if we wanted them to transport him to the hospital and we said yes. I jumped in the back of the ambulance and Lacie followed us there with her sister Chloe. Once we got there the ER team went to work fast. There were about a dozen people moving around, hooking him up, putting tubes down him to suction stuff out. It was scary but I just prayed for his safety and for the doctors to have wisdom as they worked. We got admitted into the NICU shortly after this. They transported him to Room 422 on the 4th floor at Legacy Salmon Creek Hospital where we stayed for a week before getting transferring to Randall Children’s Hospital.